The thyroid gland is located at the base of the neck and is a key player in weight loss metabolism and the production of physical energy. The thyroid gland releases the hormone, T4 (thyroxine), which circulates in the bloodstream and attaches to the receptors present in various organs of the body. Some of the body’s T4 is transformed to T3 in the liver which plays a crucial role in burning fat. Another hormone responsible for the thyroid functioning is TSH (Thyroid Stimulating Hormone) which is released from the pituitary gland and stimulates the thyroid gland to release its hormone. 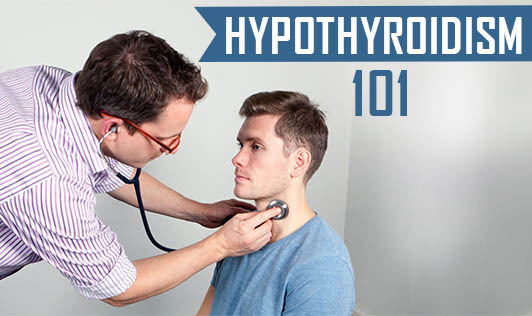 The TSH hormone gives us a measure of whether our thyroid is under or overactive. Do you know that you could have an underactive thyroid despite a normal TSH test or any normal thyroid test? These situations can occur indifferently, whether you are being diagnosed for the first time or after years of being on treatment. In this case, go for a TRH (Thyrotropin Releasing Hormone) Stimulating test and a free T3 test, both of which are more sensitive towards detecting thyroid abnormalities. Estrogen hormone dominance is one more factor which has to be monitored in hypothyroidism. Apart from the other treatments available, diet plays a crucial role in modulating the estrogen level. Therefore, remove estrogen producing foods from your diet, notably soya and soya products. Other ways in which estrogen can be avoided are by eliminating the use of synthetic estrogen available in the form of birth control pills and avoiding exposure to XenoEstrogens found in plastics, by using non-toxic alternatives like glass, whenever possible. This is also a good reason to avoid heating food in plastic containers. Limiting estrogenic components present in environmental chemicals like herbicides, fungicides, and pesticides can also be achieved by opting for organic food. Having a chronic condition like hypothyroidism can be stressful. And stress can make the condition worse. Manage your stress hormones (adrenaline and cortisol) as they can interfere with the normal functioning of your thyroid gland. The most obvious thing which you have to do is eliminate all outside stress. Secondly, manage your blood sugar levels, which will also keep free fatty acids out of your blood stream and help boost your thyroid function and metabolism. Never adopt the “fasting feasting” method. Lastly, balance your sodium levels in the body. Limit goitrogenic foods from your diet as they can interfere with iodine absorption. Iodine is an essential mineral important for maintaining good thyroid health. More importantly, work towards restoring your liver as it plays a crucial role in conversion of T4 to T3. For this, include all the necessary nutrients including the right amount of sugar as well as the right minerals – selenium. Selenium is required to convert the inactive T4 hormone to the active T3 hormone which the cells can absorb better. Other important nutrients essential for good thyroid functioning are iron, Vitamin A, and zinc. Intake of good quality protein to improve the liver function is also necessary. This also makes sure that your body doesn’t go into stress and break down muscle tissues. Last but not the least - avoid over exercising. This is because too much of exercise or the wrong form of exercise produces stress hormones in the body which further leads to imbalance in the blood sugar levels in our system; the detrimental effects of which are already discussed above. Dealing with Hypothyroidism extends beyond popping prescription pills. Often, failure to cope with the disorder efficiently is the real problem. Hence, what is really required is to plan well and strive to do the best you can to manage your condition.